JOÃO LAIA: Cinema has historically been associated with ideology, from the classic conception of a tool to propagate the “American way of life” abroad to “the factory of dreams,” which hinted at its ability to provide escape to its audience, alienating it from concrete daily issues. I found captivating the way you reclaimed the idea of dream and direct it into an understanding in which it becomes a kind of hallmark for our contemporary condition rather than a tool for escape. I would like to ask you to expand on how you employed the idea of dream as a structuring device for the show, and why you consider it an appropriate image for a reading of the here and now. CHRISSIE ILES: There are many different kinds of cinema, of which the narrative Hollywood cinema you mention is only one. Dreamlands embodies another, haptic kind of cinema, in which affect, rather than narrative, predominates. 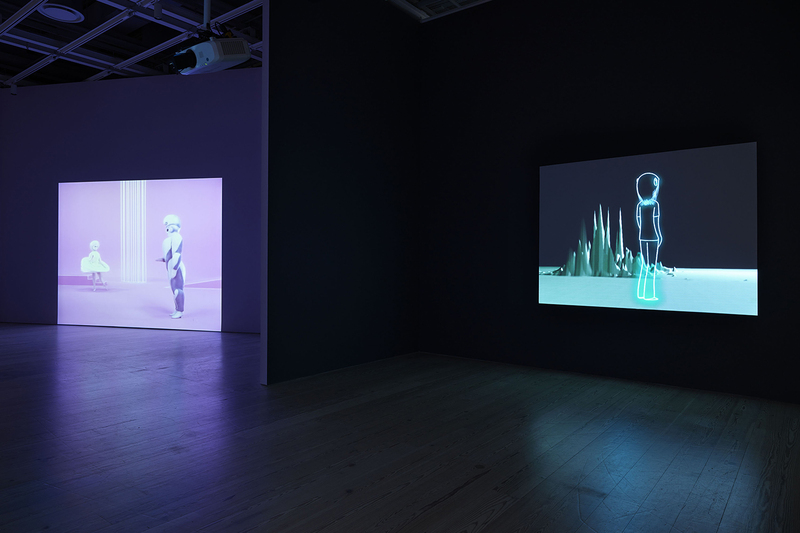 The exhibition is not about cinema; instead, it takes the cinematic space as a point of entry to explore the dramatic shifts that have occurred in the way space and image making have been transformed by cyberspace, which now controls everything. Our experience of the immersive moving image is largely controlled by corporate interests, in the form of large, dazzlingly lit screens prominently placed in strategic locations in urban areas, which manipulatively sear the impulse to consume into our brains with intense digital light. Dreamlands creates a very different kind of immersive experience, in which artistic voices engage with cinematic space as a discursive site of visual perception. The title of Dreamlands was inspired by the science fiction writer H. P. Lovecraft’s “Dreamlands,” a territory that could only be entered through dreaming, and which revealed an alternative world that, like all science fiction, is unfamiliar, futuristic, and dystopian. In most of the works in the show, this world is described through our encounters with cyborgian bodies of different kinds in immersive spaces, which reflects the current state of our anxiety and ambivalence toward technology’s saturation of our personal and social identities. JL: While focusing on contemporary practices, when the show does go back in time it focuses mainly on two moments: the early prewar twentieth century and the postwar 1950s and 1960s. Could you elaborate on how these are pivotal periods for the moving image and how they have influenced current practices? And/or how current experiments echo those past periods? CI: I wanted the show to be grounded in the current moment, in which we have experienced a dramatic sea change. As in Weimar Germany, this dramatic shift is why an anxious public fearful of change and the implications of an uncertain future has turned to a dangerous patriarchal demagogues for reassurance. The 1960s saw a similar period of instability, as a young generation reacted to the Cold War, Vietnam, and outdated social and political ideals. As Anthony McCall recently observed, “If the 1960s was a controlled explosion, we’re now experiencing the big bang.” If the 1960s was a return of the repressed experimentation and social change that Weimar Germany had opened up, the new current generation of young artists has gained a sufficient distance from the 1960s and 1970s to be able to develop their own, independent voices, and a position that is both refreshingly new and deeply resonant with both 1920s Germany and the 1960s in America. I wanted the show to reflect this. 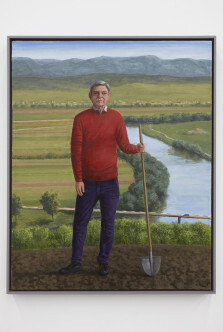 There are many group shows of young artists in New York, but few opportunities to view the current generation within a wider art historical context. I wanted to make clear how much resonance there is between these three periods, and, strikingly, how at each moment artists turned to the fluidity of the moving image. JL: In the catalogue text you establish a parallel between the classic theater experience of cinema and the white cube, both seen as modernist forms. Looking at the trend that you identify and historicize in Dreamlands, a haptic model of cinematic experience, and trying to establish a similar parallel to the present, would you say that the same tendency occurs in non-moving-image art forms? Could we read, for example, the recent recovery of materiality in sculpture and painting as part of the same haptic tendency you signal in the show for moving images? And, going further, could we read each or both tendencies as responses to the supposed immateriality of digital technology, which finds its iconic image in the cloud? CI: I don’t think there is a recovery of materiality per se in sculpture and painting. 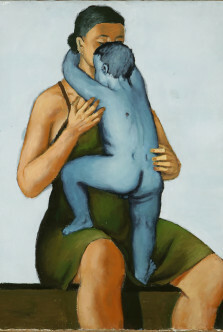 Both mediums have always been deeply grounded in the material, and have remained remarkably consistent in that regard. What I do see is a new focus on fluid, visceral materials in sculpture, and an interest in forms that evoke the interior neurological networks of the body, and its relationship to interior emotional states such as empathy, and to species other than humans. This shift is cybernetic, and is part of the extensive scholarship and discussion around the cyborgian body, reflecting the new research taking place in neuroscience, science, medicine, and psychological perception. 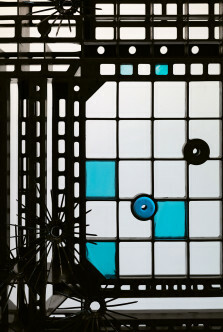 If sculpture can be said to have taken on cybernetic forms, painting has been grappling with issues of dimensionality, optical space, virtual optics, kaleidoscopic flatness, and animation, and has been influenced by the cinematic, as well as 3D printing, CGI, digital imaging, and inter-planar spatial visualizations. The works in Dreamlands address both these broad areas. Artists working across all mediums take the immateriality of digital technology as a given, and choose whether to incorporate it, or work in a different, more analog way. Binaries no longer feel useful as a way to rationalize what is happening. JL: I would like to know more about the way you choreographed the succession of works in space. Besides what seems to be an approximate chronological structure, how did you organize the show, and how did you incorporate the actual bodily experience of the audience into the ordering of the works? CI: I was in the exciting position of working with a large, empty, 18,000-square-foot rectangle of space, within which I was able to construct the architecture of the exhibition from scratch, working closely with Mark Steigelman, our head of construction and design, his assistant Anna Martin, and my project manager Lauren DiLoreto. I began by imagining in my mind what the key immersive experiences should be, the pillars around which the rest of the show would be built, and I kept coming back to Oskar Schlemmer’s Triadic Ballet (1922) and Hito Steyerl’s Factory of the Sun (2015), two immersive works constructed from dance, politics, war, robotics, the cyborgian body, the grid, music, color, flattened architectural space, and a haptic narrative. I was certain that these two works should be the first and last experiences in the exhibition, and everything fanned out from there. It also quickly became evident that the show should be chronological, to create the sense of a journey through time in which immersion was the common thread. I wanted to break down the binary between the modernist white cube (objects) versus its 1990s film/video equivalent, the black box, which felt like a tired and outdated exhibition model that did not accurately reflect the ways in which artists had been working, and had been largely imposed on them by the exigencies of an outmoded institutional and exhibition practice. Darkness is a relative state, and there are many different levels of darkness in the show. The tone of the show is shaped by both the lighting and the sound, both of which were very carefully calibrated, working closely with the AV and engineering team. To create the zone of Dreamlands, I wanted viewers to move fluidly between each space and become absorbed in each work, and to feel captivated, rather than trapped, by its temporality. As always, I began with the work itself, and the team paid very close attention to what each piece needed on every level. 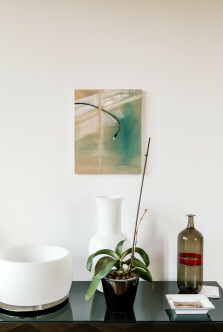 Some rooms had to be a specific size in order for the piece to be properly shown, so those were laid down as markers. In other cases, we could be more flexible. 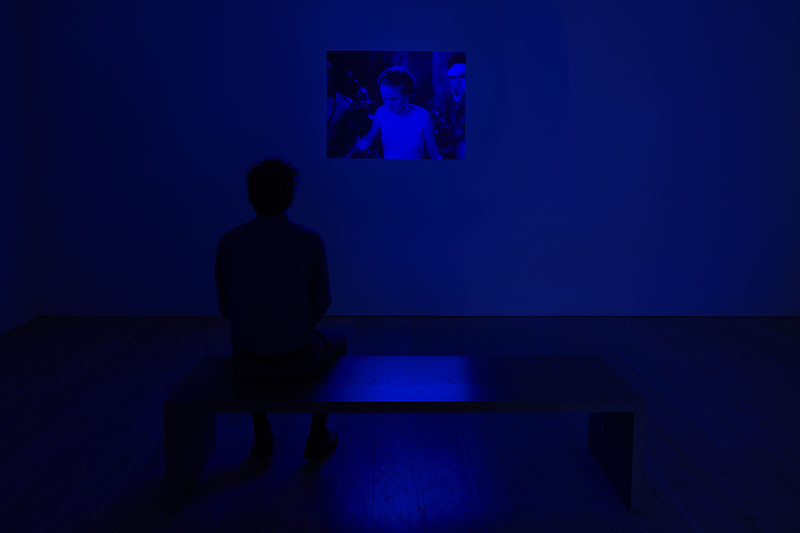 The Joseph Cornell room is small, for example, because the film is small and jewel-like; we are showing it at the same size that it was originally projected when it was screened at Julien Levy Gallery in New York in 1936, and it is bathed in blue light reflecting from the projected image. By contrast, I wanted to show Bruce Conner’s Crossroads (1976) very large, and to have it visible in the distance as you are walking through the corridors around the 1920s and 1930s works, a sinister, terrible, sublime image that beckons you, whose apocalyptic implications the works in the 1920s and 1930s sensed, and in a subtle way foretold, yet could not have anticipated. At the same time, once you enter that room, everything else fades away, and you are enveloped in the horrific, mesmerizing repetition of the explosions. As with the Schlemmer, Steyerl, and Ben Coonley rooms, the soft, comfortable, almost invisible seating allows viewers to sink into an immersive viewing experience and lose all sense of time. I placed Anthony McCall’s Line Describing a Cone (1973) and Jud Yalkut’s Destruct Film (1967) on either side of the atomic explosion because they both articulate what happened after the atomic bomb; that zero moment in which everything threatened to self-destruct. Both works dismantle cinema in a very haptic, material way—we walk through the projection beam, step on film strewn all over the floor, or are surrounded by film images rotating round the room. The Bikini Atoll atomic tests were the most filmed event in the world until 9/11, and the atomic age marked a dispersal of the cinematic into TV and media culture, which the following installation, Stan VanDerBeek’s Movie Mural (ca. 1968), clearly articulates. Immediately following that last historical work, the cybernetic body appears in the first contemporary work in the show, Philippe Parreno’s fireflies piece, in which the Game of Life, a cellular automaton, simulates the generation of new living organisms. The placement of each work unfolds a new experience of the cyborgian body and the sensorium, each building on the last, until, by the time you have moved through all the rooms in the show and emerged from Factory of the Sun, you are questioning the role of labor, and newly aware of the implications of your presence as a viewer, rather than (as Steyerl argues) a data object to be mined. Turning the corner and encountering the Schlemmer once again, the portentousness of the final act of Triadic Ballet, in which the masked, costumed figure of war tolls a bell in the manner of a sword, becomes newly evident. 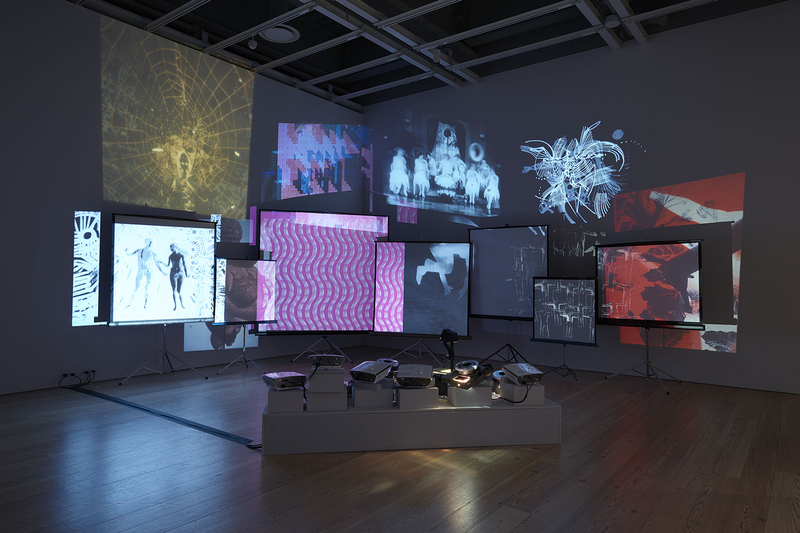 JL: The figure of the cyborg is a recurrent image in the exhibition. Donna Haraway is a reference that easily comes to mind when addressing the cyborg, but also Rosi Braidotti when you mention posthumanism toward of the end of the catalogue text. Were these thinkers references in the construction of Dreamlands? Are you interested in their work, and/or how do you see a relation between their take on cyborg and posthuman in the context of contemporary moving image practices? CI: It became clear early on in my research that a number of interrelated themes were paramount in the current thinking, and I immersed myself in texts, lectures, discussions, and informal conversations with artists, writers, scholars, and thinkers around issues of the cyborg, feminism and gender politics, the trans community, the Anthropocene, science fiction, Afro-Futurist cinema, empathy, neuroscience, cybernetics, touch, digital animation, and trans-species. Donna Haraway, Rosi Braidotti, and many others were important to my thinking, but I was also listening to critiques of Haraway, and trying to understand how her earlier writing was being rethought in this current moment. Contemporary moving image practice, in all its diversity, is strongly cybernetic, but in a way that is shifting, as technology changes, and older patterns of using it are more fully absorbed. 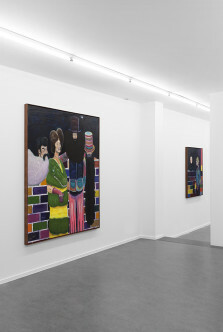 JL: You mention Jonathan Crary’s book 24/7 (2013) in your catalogue text, framing the exhibition as a “map of interior dimensional dreaming.” Would it be possible to also look at the show as a concentration of works that stage intense experiences and in this sense as a space that echoes our daily lives permanently punctuated by nonstop stimulus for production and consumption? CI: I see the space that the show creates as being very different from our daily lives, in that it disrupts our readings of projective space as largely commercial, and replaces those spaces with experiences that make us think and feel differently, and stimulate the imagination rather than the desire to consume. JL: Following on the previous questions, would you say that in our current accelerated and hypermediated environment we have become cyborgs? Is Dreamlands a stage for the enactment of our cyborg nature, or rather a platform for a self-reflexive understanding of such conditions? Or both at the same time? CI: I would say that Dreamlands allows both to occur simultaneously. We are in a constant state of transformation, and our relationship to each other and to the world is increasingly cyborgian in its mediation by technology. Yet we are still far from the future that science fiction always holds in front of us, just out of reach. As the world teeters on the edge of ecological self-destruction, maybe Dreamlands marks a key moment in our relationship to technology, one in which we remain definitely human, yet have begun to shift into an apocalyptic cyborgian state, the intensity of which Schlemmer’s robotic masked figures could only, as the storm clouds gathered, barely imagine.